The Rhodesian Ridgeback originated in Southern Africa where the early European settlers mated their imported sporting breeds with the small, fierce hunting dogs owned by the Hottentots in order to produce a guard/hunting dog ideally suited to local conditions. The Hottentot Hunting Dog had a ridge of hair along its spine running in a reverse direction to the rest of the coat and this particular characteristic became a feature of the cross matings between the European breeds and the native dogs. 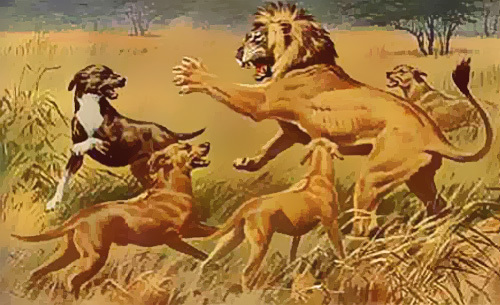 These "Ridgebacks" were used as functional all purpose guard and hunting dogs and it was found that they surpassed any other breed when hunting lions. During the late 19th century the reputation of "Ridgebacks" in this field became established through the exploits of a famous big game hunter in Rhodesia named Cornelius Van Rooyen, who had a pack of these ridged dogs. Van Rooyen's dogs were very similar to today's Rhodesian Ridgeback. Mylda L Aresenis' "Ridged Dogs in Africa". It was not intended that the Ridgeback should actually kill the lion but rather keep it at bay until the hunter could shoot it. Ridgebacks would, however, kill lion cubs without hesitation and pull down lesser game with ease. The Standard of the Breed was drawn up following a meeting of "Ridgeback" owners in Bulawayo in 1922 and this was accepted by the South African Kennel Union (now the Kennel Union of Southern Africa) in 1924. The Standard borrowed much from the Dalmatian Standard and envisages a "strong, muscular and active dog, symmetrical in outline and capable of great endurance, with a fair amount of speed". One of the earliest Rhodesian Ridgebacks was "Eskdale Dingo" (registered on 16th March 1926) owned and bred by Mr FA Barnes of Eskdale Kennels - photo extracted from Major Hawley's "The Rhodesian Ridgeback - The Origin, History and Standard"
Rhodesian Ridgebacks have adapted well to modern day life. They are highly intelligent and have a loving, loyal temperament with those they know, but are distinctly off-hand with strangers. They are good guard dogs, but do not bark unless there is a reason. They are quite happy to lie about all day doing nothing and yet are enthusiastic about walks or expeditions. No single breed of dog suits everybody and there are aspects of the Ridgeback character which would not endear them to some people. They can be strong willed, determined, independent and extremely obstinate. There is nothing slavish about a Ridgeback - the manback relationship tends to be one of partners rather than a master/servant situation. He never forgets love and understanding, nor does he lightly forgive harsh treatment. He is a dog of noble bearing whose physical attributes should reflect his role as guardian, companion and hunter. The adults do not require vast amounts of food. They are hardy dogs and routine care consists of checking the ears, cutting the nails, weekly grooming and regular worming an inoculation.